It is times like these that I wonder how I get myself into these things. Starting in a few days is a conference that I am heavily involved in organising – it is a major international conference on ionic liquids (for more information on the conference see: http://apcil-asil.unsw.edu.au/), which is one of my principal research areas. Being involved sounded like a good idea a year or so ago – now I’m not sure where the time is going or how everything will get done. Don’t get me wrong, scientific conferences are amazing. They might be a lot of work for the organisers but they are invaluable for the attendees. It is one of the best ways of keeping up with new work in your area, to get a sense of the research going on outside your area and to meet other people passionate about science; this last reason (which my girlfriend refers to as ‘catching up with my mates’) remains one of the best reasons to go to a conference. That conversation started a fascination with ionic liquids. Put simply, these are salts that are molten at room temperature. Being salts, they don’t evaporate (you can leave them in a beaker on the bench for months … we’ve tried!) and so some have suggested that they might be good replacements for volatile organic solvents. One of the problems stopping their widespread use is that if you replace an ordinary solvent with an ionic liquid for a reaction, often the reaction goes very differently (this was actually the basis of that first lecture on ionic liquids that I saw) – the reaction rate might be faster, it might be slower or even the product might be different. Synthetic chemists don’t like this lack of predictability – nor would you if you couldn’t guarantee that the material you’d spent weeks making would react how you wanted it to. At the moment, the effect of ordinary solvents (like acetone and ethanol) on reactions is well known – there is a predictive framework for what happens if you change solvents. To make them truly useful, a similar set of guidelines is needed for ionic liquids. And developing this sort of understanding is the sort of thing that excites chemists like me. Formulating this set of guidelines has been the target of my research group for more than ten years. Initially with very simple, well-understood reactions, we have examined how ionic liquids affect reaction outcome and piece-by-piece developed our understanding. What started very simply has expanded dramatically, with my group now designing new ionic liquids that (based on what we now know) will affect a reaction the way we want. So after all this time, can we do it? Can we predict if using an ionic liquid will make a reaction go faster? For a lot of reactions, though not all, the answer is ‘yes’ and we can even tell you which ionic liquids might be best. We are still striving to make it quantitative as many of our predictions remain qualitative – the understanding still needs to be refined. Being involved with ionic liquids research has had a lot of benefits outside just the research I’ve described. In order to do the work, we had to develop ways to follow reactions in ionic liquids (not a trivial thing to do) and my group works extensively with the excellent staff in the NMR Facility at the Mark Wainwright Analytical Centre at UNSW (see http://www.nmr.unsw.edu.au/), which in turn has brought about a lot of other collaborations. To understand what happens at the microscopic level, we have turned to molecular dynamics simulations and my group and I regularly travel to the UK to work with our collaborators. And sometimes it is the little, odd results that take you places. Like the fact that some compounds dissolve really well in ionic liquids which led me to Boston College to make fragments of bucky balls in ionic liquids. Or that sometimes ionic liquids aren’t as inert as might be reported, which led to the determination of acidities of ionic liquids and related compounds that branched off into organocatalysis which is the area which half my research group now investigates. And then there’s the conferences – from Washington DC to Taipei, Ottawa to Santiago de Compostela, Haifa to Florianopolis. Travelling, seeing old friends and meeting new ones, being inspired. For now though, I’d better get back to the organisation of the conference here or it will never happen and I might prevent the start of someone else’s story like this. Dr Jason Harper is a graduate of the University of Adelaide and the Australian National University. After positions at the University of Cambridge (as an NHMRC C. J. Martin Postdoctoral Fellow) and the Open University, he was appointed to the academic staff in the School of Chemistry, University of New South Wales in 2002 where he is currently a Senior Lecturer. 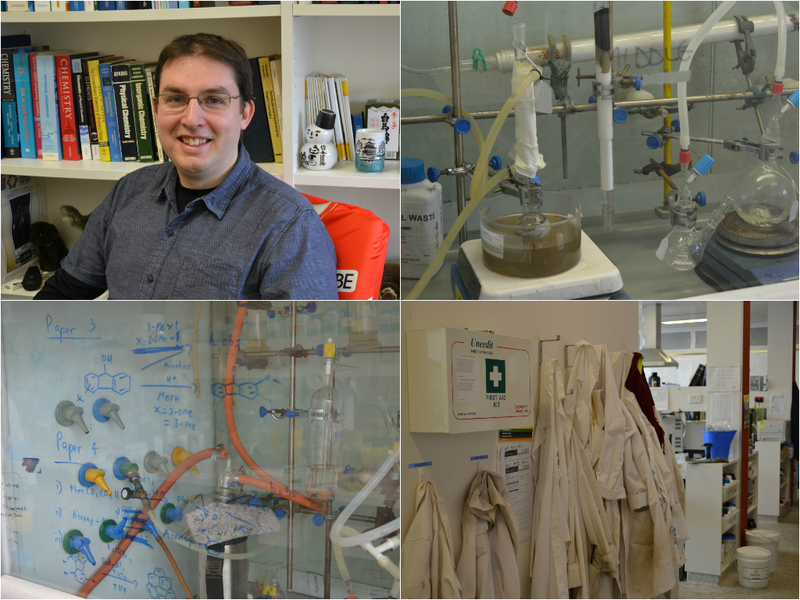 His research interests fall broadly in the area of mechanistic and physical organic chemistry with a particular focus on understanding the chemical processes in ionic liquids. Outside the lab, he tries to keep up with a diverse range of activities ranging from cycling ridiculous distances periodically (he is currently training to ride around Port Phillip Bay in a day in October) to learning Taiko (Japanese drumming) and Oni Kenbai (Demon Sword Dance).